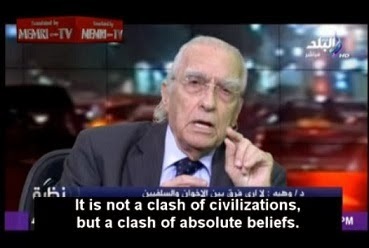 Gypsy Scholar: Both the Muslim Brotherhood and the Salafis want an Islamic Caliphate . . . Both the Muslim Brotherhood and the Salafis want an Islamic Caliphate . . . Both the Muslim Brotherhood and the Salafis want to impose their understanding of Islam upon society in its entirety, in an effort to establish an Islamic Caliphate. The Islamic Caliphate supersedes countries and states. This leads directly to the Islamization of planet Earth and taking control over it. The Muslim Brotherhood and the Salafis are fundamentalist movements, which means that they are committed to refrain from using the intellect when it comes to religious texts. Therefore, they are by necessity committed to stick to the past. They follow what has been said in the past to the letter. That is why they fight to include the phrase "shari'a rulings" in the constitution. If you oppose this, they try to get it into the preamble. They would do anything to shackle you to a specific tradition and to the past, thus abolishing the future. I recall reading somewhere (or in several places) that in reaction to the rationalist thought of the Muslim philosopher Averroes, Islam rejected reason and a deity with a rational nature in favor of revelation 'grounded' in an inexplicable, arbitrary deity whose will must be strictly followed -- regardless what reason says -- because this divine will is inexplicable: Allah decrees what he decrees and needs no justification, no theodicy. Islamists thus model their beliefs, rituals, and acts upon the earliest Muslim leaders so as to be certain of remaining precisely upon the correct path. With no recourse to reason, there remains only force to ensure submission. For this reason, perhaps, Wahba -- in reply to an important ambassador from one of the Gulf states inquiring how to "develop" -- advised him "to expel Ibn Taymiyyah and bring in Averroes instead." Ibn Taymiyyah is the Muslim thinker of the 14th to 15th centuries whose writings have been powerfully influential upon current-day Islamism. To replace him with Averroes -- whose philosophical views are sometimes said to have influenced the development of secular thought in the West -- would be to exalt reason over revelation and all that this entails. Wahba is thus advising that the Islamic world follow the Western path to modernity . . .